These are my mommy friends and our kids. 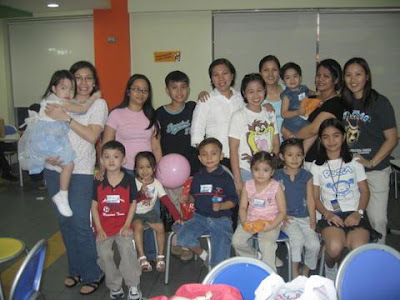 I think this was in 2004 when Rocio celebrated her birthday in Jollibee Pioneer. AMGURLS was the name coined by MayA for our mommy group. We all met in cyberspace, being members of a parenting group. That was in the early Y2K. The name of the group was sort of a pun because we don't usually meet when the sun is still shining but during evenings because most of them are working in offices. Get-togethers then were called EBs (eyeballs). There are 13 members in our group and some are absent in this gathering.